Don't let this rather vague-looking cover trick you into thinking this is not a full-fledged horror story. 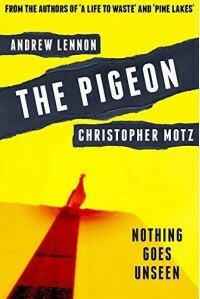 THE PIGEON is not some little psychological tale with a talking bird or poetry like an Edgar Allan Poe story. And it's not some fancy literary fiction either. It's an in-your-face, fast paced, gory, twisty-turny little novella that might even make you laugh at times. How much fun is that? A lot! It's a LOT of fun. When Andrew Lennon asked me if I could review this book last fall I think it was, I said sure without really knowing what I was getting myself into. If I had known it was this short, I probably would have tried to squeeze it in even sooner. A young lady hates her job and is being stalked by her ex-boyfriend. He shows up at her house and things just go downhill from there. Fast! There's no way I can get across to you how surprised I was at nearly every turn this story took. And it's because of the fact that I want you to be surprised too, that I'm not going to go further into the plot. If you like your horror unpredictable, bloody and gory, with a sense of humor on the side? THE PIGEON is for you!